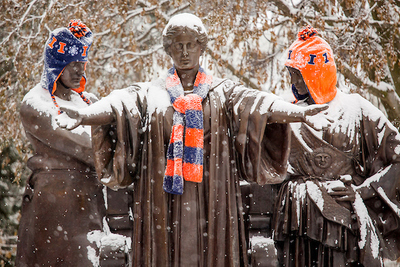 Alma Mater, Labor and Learning dressed for winter. Several outbreaks of unseasonably cold conditions throughout the month contributed to the low temperatures. The coldest temperature recorded for the month was 1 degree at three stations in Lee, Carrol and Knox counties on the night of Nov. 28. The highest temperature recorded for the month was 70 degrees at a station in Du Quoin on Nov. 1. Temperatures across Illinois were typically 5 to 10 degrees below normal, a trend that extended across most of the Midwest. The below-normal cold conditions were concentrated in sections of northeast Missouri, southeast Iowa and west-central Illinois. A potent low-pressure system tracked through central Illinois at the end of the Thanksgiving weekend, bringing with it a wide range of weather to the state. Thunder, rain, ice, snow, wind and blizzard conditions were all reported in varying locations on Sunday, Nov. 25. Both Moline and Chicago O’Hare International Airport set record-low maximum temperatures on Nov. 27, with recordings of 22 degrees at Moline and 25 degrees at O’Hare. 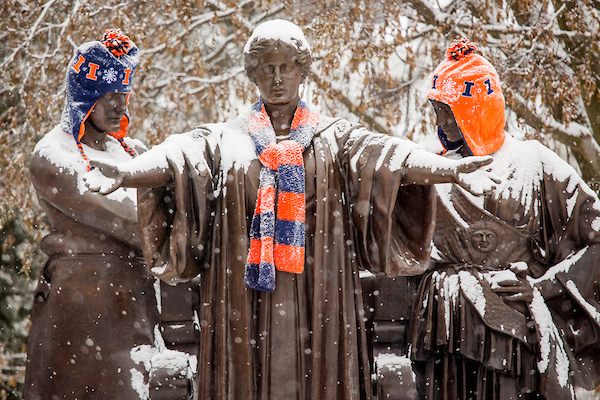 The first snow accumulation of the season happened in early to mid-November. By Nov. 15, the Springfield Abraham Lincoln Airport had already broken its record for the snowiest November with 5.3 inches. Total monthly snowfall accumulation in Springfield measured 11.4 inches, ranking November 2018 the snowiest November on record for that area, as well as for Rockford (15.8 inches) and Moline (18.4 inches). The Nov. 30 outlook for December from the National Weather Service Climate Prediction Center shows an increased chance of above-normal precipitation statewide, becoming more likely westward into the high plains. There is a slightly increased chance of above-normal temperatures statewide.